By now, pretty much all of you know that I am a gestational surrogate for some amazing IF's (intended fathers.) The time is flying by at this point and it is hard to believe that this long journey is almost over. I am 32 weeks as of yesterday and this big girl is growing like a weed. I had a 3d/4d ultrasound done yesterday and wanted to share an update and some pictures from it with all of you that have been following along. Baby C has plenty of hair and is already estimated at between 5-6 pounds. She has a double chin, chubby cheeks and is sure to be a cutie when she finally arrives. Thanks to everyone who continues to support me and follow along as this surrogacy journey comes to an end! Okay, I am going to be really brave and throw a bare belly photo out there. 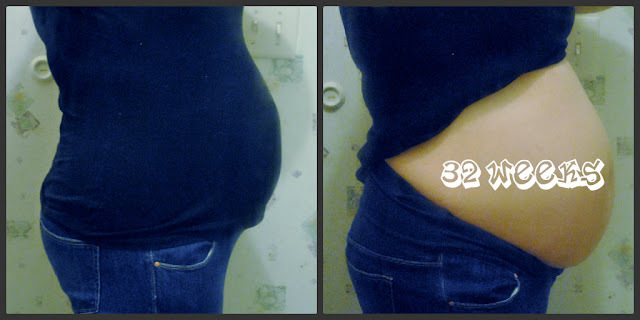 Don't you love how I covered some stretch marks with the 32 weeks sign? Baby C has not given me any new stretch marks, but I do have them from my four boys, so had to disguise them a bit. She has dropped a lot, so I don't think I look nearly as big as I did at 28 weeks. I cut my head off this time because I am rocking a pony and no makeup. What an amazing thing you are doing. Giving someone a child. Those cheeks and that pout! LOVE IT. Those IF's are gonna have to fight off everyone when she grows up! So cute, and you look great! Those are really neat pictures. So exciting... you're doing a great thing! You look fantastic! What a beautiful baby girl you are carrying! I wish I could be more like you... I am still struggling with the fact that I have three boys and I may never have a little girl. I love that you are doing this. Such an amazing thing to do an dyou look amazing! I'm in awe... at the ultrasound pics and with YOU! You're amazing! She already looks so cute! How exciting for them! You look awesome! I love those chubby cheeks on surro baby! I;m loving these 3d images... technology is something. Look at those cheeks! So amazing what you are doing. I bet baby's parents are so happy to see these pictures! This is so exciting! I'm am in awe of you doing this and think you are amazing! She is adorable in the ultrasound and looks like she has some cute cheeks on her already. Oh my goodness, she's gonna be a doll! I can't believe how clear the 3d ultrasound is, amazing! You are awesome for doing this!